A mortgage is a conveyance of title to property that is given as security for a loan until the grantor (borrower) repays the lender according to terms defined in an attached promissory note. It contains a lien against the security property that ends when the debt is repaid. The short form mortgage covers the requirements for most non-institutional lenders. 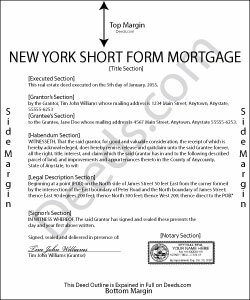 In addition to any other necessary documents, the short form adds another step of recording a master form mortgage. A master form mortgage is a blank, unsigned long form mortgage with a special cover sheet attached, requesting recording for reference purposes only. By referencing the recorded instrument information on the master mortgage, all rights and obligations of the parties are preserved. Because this document contains fewer pages, it's generally less costly to record the short form mortgage. Stephenie A. said: No review provided. Deborah B. said: Easy download, and super easy to fill out. Had them recorded Friday with zero issues. Recommended. Amie S. said: The forms that I downloaded from Deeds were perfect for what I needed. I even checked with a lawyer to see if the papers would work and she said yes. Reply from Staff: Thanks Amie, have a great day! Marsha C. said: Awesome so far! What a great service! Reply from Staff: Thank you Marsha, we really appreciate your feedback.